Use this for your online diary blog, share your love story, sweet or bitter, or you want to tell to someone you love. saya mau tanya, kenapa posting yang terlihat itu cuma 1 postingan saja ???? can you convert it to HTML code ? i want to use it as my blog template?? gimana cara bikin jadi template blog? how to make it as my blog template? 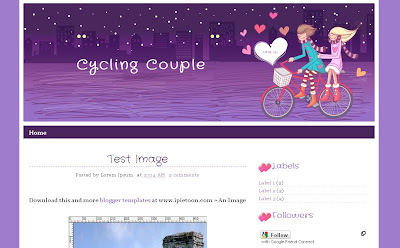 The wonderful and more fantastic template shared on the site because in the post define the cycling couple love so that can be know that regarding post. Blog, share your love story, sweet or bitter, or you want to tell to someone you love.